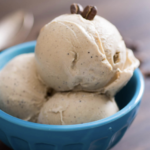 If you occasionally crave iced coffee, you're going to love this low carb coffee ice cream I found on the "I Breath I'm Hungry" website. It's thick and creamy, and.. well.. I wish I could say it's quick and easy to make. But it's "ice cream" so it's going to take a bit of effort. Feel free to experiment and flavor it to your taste, with coco, cinnamon, hazelnut, etc. Combine the coffee beans, heavy cream and almond milk in a medium bowl. Soak for 2 hours, or overnight if you want a stronger flavor. Heat the cream, milk and coffee beans in the microwave for 2 minutes. Strain out the beans. Return the cream mixture to the bowl and add the splenda, vanilla, salt, xanthan gum (if using) and egg yolks - stir well. Microwave for 30 seconds, stir. Microwave for another 30 seconds, stir. Microwave for another 30 seconds, stir. At this point it should be slightly thickened (if not, microwave 30 seconds longer). Pour it through a sieve to remove any lumps, then chill in the freezer for 30 minutes or the refrigerator overnight. When the custard is chilled, run it through an ice cream maker following the manufacturer's instructions. If you don't have an ice cream maker, try this method using zip lock bags, ice, and salt to freeze your custard mixture. Using organic Heavy Whipping Cream when you can find it will greatly decrease the amount of carbs in this recipe. Not all HWC are created equal - some contain starches to thicken them, which results in higher carbs so be sure to read your labels!